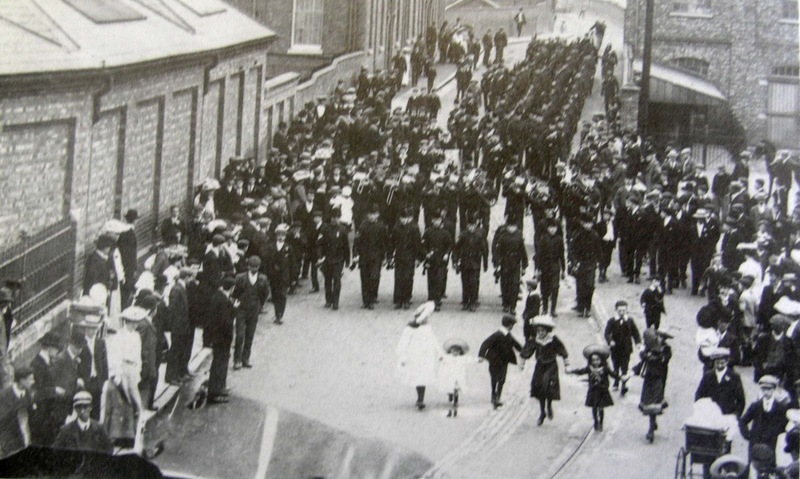 This photograph was taken in 1919 to mark the return of the 1st Bucks Batallion from the War. The photo, probably taken from an upstairs room in the Royal Engineer, gives us a view of what used to be there. 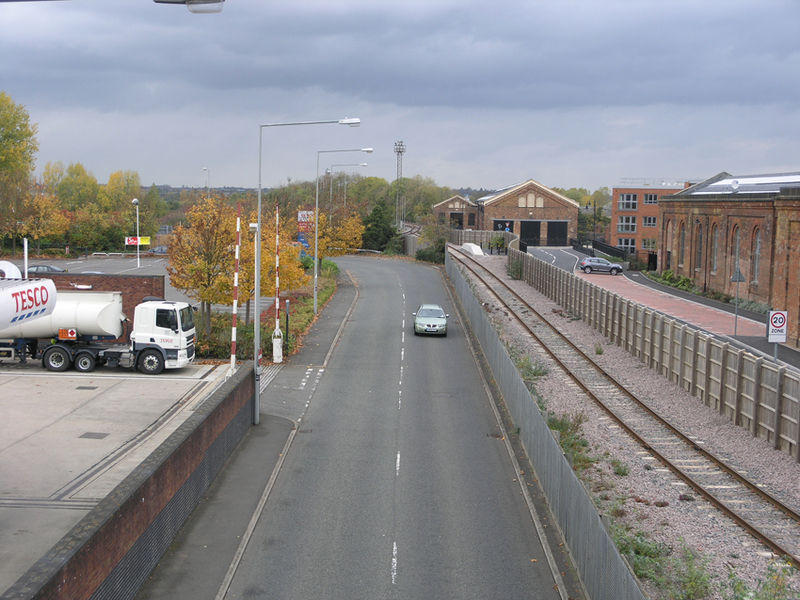 The bridge, which still carries the Stratford Road, is seen on the left in the distance. The buildings in the foreground on the left were probably newish at the time of the photograph. The wrought iron railings guard against the drop into Gas Street. Before the bridge on the left are the Works Main Offices which burned down in the 1980s. The Gas Street houses were pulled down in the 1890s. The building on the right was the original Market Hall. It was gutted by fire in 1906 but rebuilt as a laundry. Later it became a Veteran’s Club. There is still a building on this site but much modified from the original. You can also see tramlines in this picture. The tram offered a regular service between Wolverton and Stony Stratford and at one time even ran to Deanshanger. As I have often remarked, Wolverton’s planned development suffered because it was a pioneer venture. Nobody could have forecast the phenomenal and almost overnight success of the railways and the directors were properly cautious about their original building program. However, expansion soon became necessary. 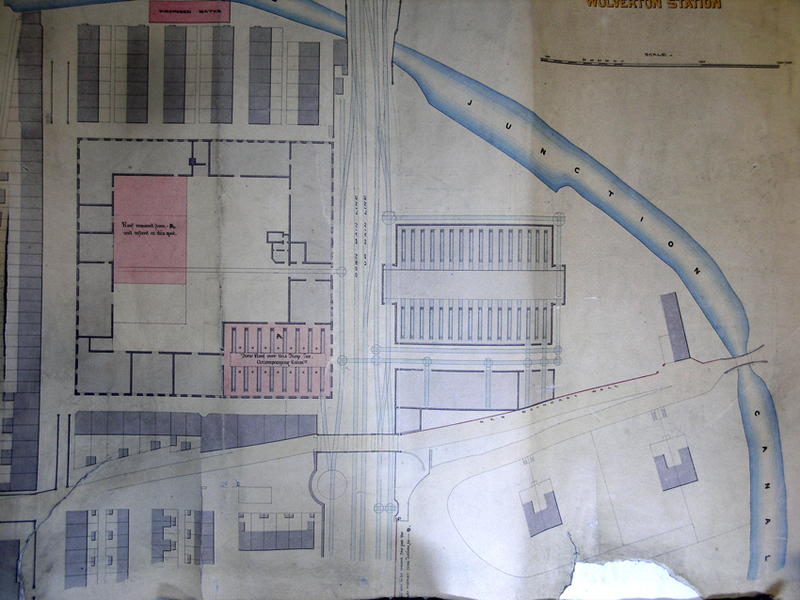 The plan below, from about 1845, shows the new engine sheds to the right hand side of the line. This eventually became part of the “Triangle Building”, now converted into flats. The original engine shed is also marked for modification and development. These are shaded red. You can see in plan form Bury Street on the left and the three short northern streets: Garnett Street, Cooke Street and Walker Street. Gas Street is to the south of the Engine Shed but by this time the Gas Works had been moved to the south east of the station. You can also see the beginnings of Creed Street, Ledsam Street, and Glyn Square and four of the villas to the south. The long narrow building beside the canal was the Reading Room, which also doubled as a Wesleyan Chapel. Another interesting feature of this plan is the narrowing of the canal under the bridge. The original bridge was probably one of those hump-backed bridges with a very narrow span. The present bridge is built much higher with a wider span. The original road level was probably much lower than it is today. In 1840 Francis Whishaw, an engineer who was later to be associated with the design of the 1851 exhibition visited Wolverton and later wrote up his description in his monumental Railways of Great Britain and Ireland, published in 1842. I reproduce it here. It is, frankly, a boring piece of prose. Whishaw was an engineer and precision was his thing, but for those of you who wish to study the origins of Wolverton in more depth, it is useful reading. I will accompany it with this ground plan to give you some idea of what he may be talking about. The buildings lately erected at Wolverton, as the principal station for the locomotive engines, form, perhaps, one of the most complete establishments of the kind in the world. The site of this establishment is on the left side of the railway, at a distance of about 52 miles from the London terminus, and 59 ½ miles from that of Birmingham, having a frontage on the Grand Junction Canal. The buildings, which are of plain but neat design, and constructed chiefly of brick, surround a quadrangular space 127 feet wide by 216 feet deep, the entrance to which is under an archway in the centre of the principal front. The whole length of the buildings is 221 feet, the depth 314 feet 6 inches, and the height 23 feet; the main walls are 2 bricks in thickness. Besides the central gateway, which is 12 feet 6 inches in height above the rails, there are two side-entrances: the one to the large erecting ­shop, the other to the repairing-shop. The erecting-shop is on the right of the central gateway, and occupies one half of the front part of this building. It has a line of way down the middle, communicating with a turn-table in the principal entrance, and also with the small erecting-shop, which is on the left of this entrance. Powerful cranes are fixed in the erecting-shops for raising and lowering the engines when required. Contiguous to the small erecting-shop, and occupying the principal portion of the left wing, is the repairing-shop, which is entered by the left gateway. One line runs down the middle of this shop, with nine turn-tables, and as many lines of way at right angles to the central line. This shop is 131 feet 6 inches long and 90 feet wide, both in the clear, and will hold eighteen engines and tenders, or thirty-six engines. It is lighted by twenty ­four windows, reaching nearly to the roof. 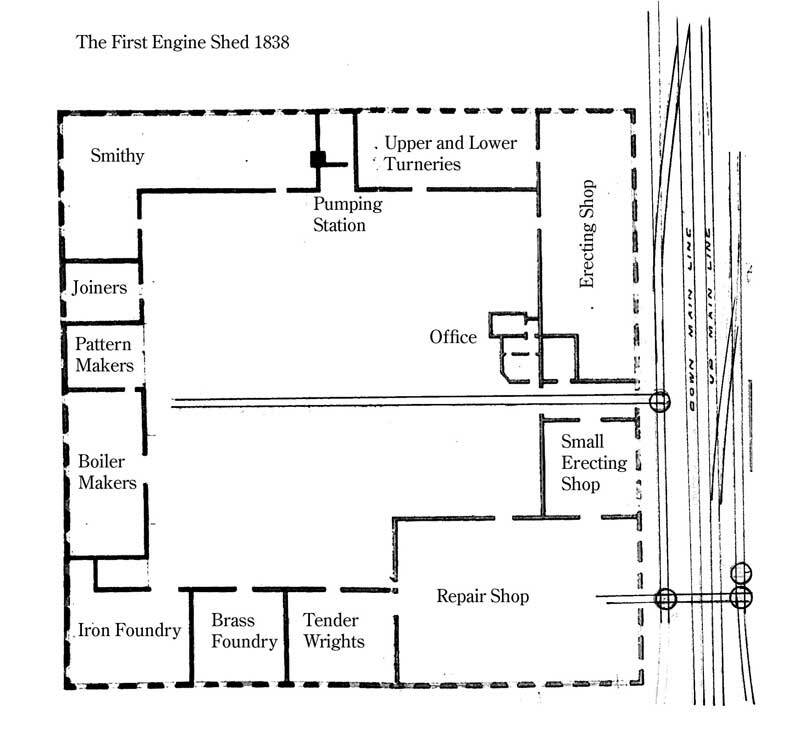 In the same wing, and next to the repairing-shop, is the tender-wrights’ shop, having the central line of way of the repairing-shop running down its whole length, with a turn-table and cross line, which runs quite across the quadrangle, and intersects a line from the principal entry to the boiler-shop in the rear of the quadrangle. The remainder of the left wing is occupied by a room for stores on the ground-floor, with a brass-foundry and store-room over; and the iron-foundry, which extends to the back line of the buildings. The right wing contains the upper and lower turneries, each 99 feet long and 40 feet wide; the upper floor being supported in mid-line by nine iron columns. There are fourteen lathes in the lower, and eight in the upper turnery. The fixed pumping-engine house is also in the right wing, occupy­ing the central portion thereof, and measuring 26 feet 3 inches by 19 feet 6 inches. There are two engines, each having a 14-inch cylinder and 4-feet stroke, and worked with from 35 Ibs. to 40 lbs. pressure; the fly-wheels making twenty-four revolutions per minute. The boilers are placed in a sunk area in front of the engines, and separated there from by a 9-inch wall. The water is pumped from a well in the centre of the engine-house; this well is of elliptical form, the transverse and conjugate diameters of which are respec­tively 11 feet 6 inches and 8 feet 2 inches. The brickwork is 9 inches thick, and the whole depth of well 93 feet. At the bottom of the well are two tunnels, running north and south, each extending 33 feet from the well. These tunnels are 8 feet wide, 8 feet 6 inches in extreme height, and 6 feet to springing of segmental arch; the brickwork is 13 ½ inches in thickness. The two pumps are each of 7 inches diameter. There are two tanks to receive the water from the well: the one above the engine-house having a capacity equal to 2590 cubic feet, or 15,540 gallons; and the other 3850 cubic feet, or 23, 100 gallons. This latter tank is over the gateway. Besides pumping water for the establishment, and giving motion to the lathes and other machinery, these engines have another duty to perform, which is that of working the blowing-machine. The blowing cylinders are fixed on a floor above, and immediately over the engine-cylinders, are 3 feet in diameter, and are worked by the same piston-rods, having a 4-feet stroke. The air is admitted at the top of the blowing-cylinder by a pipe communi­cating with a vertical cylinder, 10 inches in diameter, which is carried out above the roof. The 9-inch blast-pipe passes from the top of the cylinder, on the opposite side to that in which the air is admitted, and runs down to the level of the smithy, to blow the numerous fires which range along the sides and ends. The smithy occupies the north-west angle of the building, running partly down the right wing, to the extent of 137 feet 3 inches, and joining the engine-house, and partly along the back portion of the building, to the extent of 76 feet. It contains eighteen single, and three double hearths. 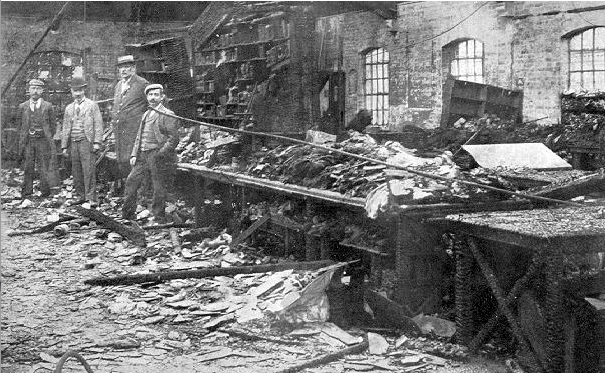 The remaining space of the back portion of the buildings is occupied by a joiners’-shop, with store-room and pattern-shop above, the hooping-furnaces, and a boiler-shop. In the boiler-shop there are two hearths; and, commu­nicating with the machinery worked by the engines above described, are two drills and a punch. The lodge, superintendent’s office, and drawing-office, are in a building within the quadrangle, and close to the principal entrance. 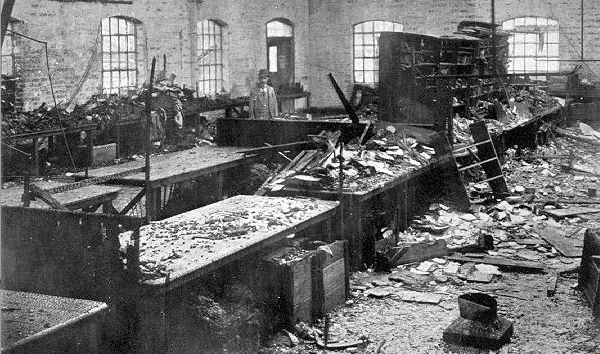 The various departments of this establishment are warmed by steam, issuing through cast-iron pipes laid in channels, paved over, and furnished with proper ventilators. On each side of this extensive structure there is a street running down to a wider street at back, which is 40 feet in width, including the footpaths. In the left street are the gas-works, and eight cottages of two stories for the workmen. Between the street on the right and the canal, other streets run down at right angles. In the principal street, which is at the back of the locomotives’ building, there are six houses of three stories, for clerks and foremen; twenty-two of two stories ; and eight with shops on the ground­floor. From the main street there is a communication with the high road, which passes over the railway to the south of this station. In front of the locomotives’ building there are four lines of way; the main double way being in the middle, with an intermediate space of 6 feet 5 inches, the whole width of way being about 60 feet. On the side-line next the building are two engine-races, or pits, 3 feet 9t inches wide, and 2 feet 4 inches deep from level of rails. A grating is fixed in the bottom of each race, to let off the water from the engines, when required, into a proper drain below. On the cross lines, which are in communication with the locomotives’ establishment, are six turn-tables; two of which are in front of the carriage­landing, which is on the east side of the railway. In this carriage-wharf or landing there are two docks or recesses, each 9 feet 2 inches wide, 5 feet deep, and 3 feet 84 inches high, with proper indents in the coping to receive the buffers and chains. To support this wharf four needle piles of oak are driven at a distance of about 10 feet 6 inches from the back of the wall, and between these piles and the elm planks, which are close to the wall, strutts are introduced 10 feet in length. The whole width of this landing is 28 feet 6 inches, and it is run out with a proper slope leading from this station to the main road. Fronting the canal, and on the east side of the railway, is the goods warehouse, which is furnished with a double way, forming a communication with the main line. There are two lines of way running down the length of the warehouse between two stages or platforms, 15 feet wide and 4 feet high. On these stages are cranes for raising or lowering goods from or to the canal-barges or railway-wagons. Beneath the front stage is a coal-store, with six loop-holes next the canal. This building is lighted by four sky­lights in the roof, which is slated, and projects over part of the canal to pro­tect the barges in bad weather. The temporary passenger-station is on the north side of the canal. Here the trains are allowed to stop ten minutes, provided they arrive in proper time, for the purpose of allowing passengers time to take refresh­ment. Every engine with a train from London or from Birmingham is changed at the Wolverton station, which answers the double purpose of having it examined, and of easing the driver and stoker. We consider even fifty miles too great a distance to run an engine without examination; and have seen on other lines the ill consequences arising from the want of this necessary precaution. We should prefer about thirty miles’ stages, when it can be managed. If you stand above the bridge over McConnell Drive today you will get this view. Only the rusted single line of track would indicate that this was once the main line from London to Birmingham. 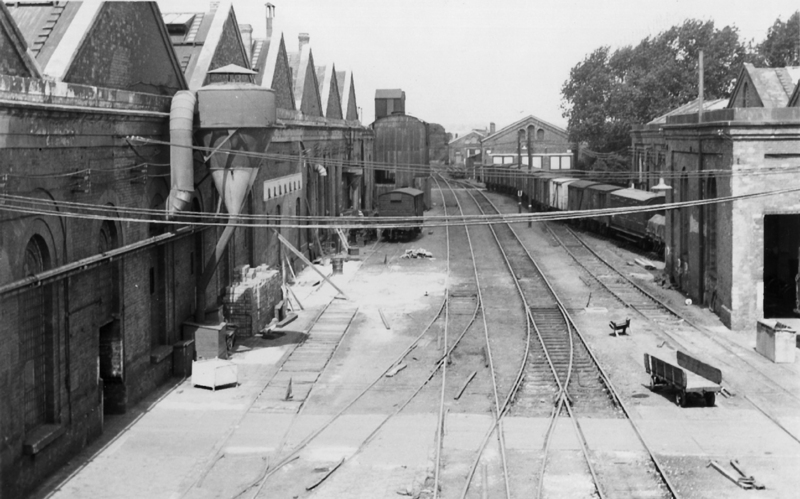 The building on the left, albeit with a different roof, was the first Engine Shed and the first building to be erected at Wolverton Station. As I have observed before, it was intended for the servicing and maintenance of the early steam engines. The original site was 8 acres and this building became the nucleus of a workshop development that spread over 80 acres and employed in its heyday almost 5,000. Alfred Blott, the Station Master at Wolverton, got married at Willesden in 1843. He invited George Weight, incumbent at Wolverton to conduct the ceremony. Blott, a farmer’s son, styles himself as “gentleman” on the marriage certificate. Alfred Blott had arrived! Class and status are sometimes difficult things to unravel. Wolverton was in many ways a more homogeneous community than most in that the bulk of its new population were working men and their families. They were much better paid than their agricultural counterparts, but for all that they were still what we would later recognize as “working class”. Wolverton then and subsequently had a large working class population and a small middle class. It had no upper class. Those in middle class occupations had status within the community and this status can probably be measured by income. J E McConnell £850 pa. rising to £1200 pa. Almost from the beginning the railway distinguished between weekly wage staff and salaried staff – the latter more likely to fall into a middle class status. Such status was not always a matter of income. An engine driver such as Barnabas Panter, who lived on Creed Street opposite the schoolmaster, probably earned as much, if not more than Laing, but he would not be accorded the same status. Engine Drivers were paid at a daily rate of 7/2d, which, if they worked 6 days a week could realize a weekly income of £2 3s. However, it was hard and dangerous work. Interestingly, Barnabas’s son William eventually bridged that divide. He started work as an apprentice, worked his way up to foreman and the assistant superintendent at Wolverton. He was promoted to salaried staff in 1877 at £250 p. a. and at this point moved into one of the villas. In 1885 he was appointed Superintendent for the Carriage Works of the London and South Western Railway at the new town of Eastleigh, moved into a nearby mansion, and became Eastleigh’s most prominent citizen. He started life in a working class household and ended it entrenched in the middle class. He even has a street named after him in Eastleigh. The Inspector of policemen, Martin Deacon, earned £1 15s a week, or about £90, certainly equivalent or better than some salaried clerical staff, but as a weekly wage earner would find himself in a working class category Policeman who were quite numerous in the 1840s before the creation of signal boxes and remote switching of points, were paid 19s a week. The ticket collector at the station, William Hazelgrove, was paid £1 3s. a week and the foreman porter, £1 10s a week. Wolverton was then, and remained, an unusual social mix. There were no “upper class” people living in Wolverton. There was a tiny middle-class and a large (even dominant) working class population of skilled artisans earning wages well above the agricultural median. There were virtually no poor people, other than those unfortunates who had been incapacitated by injury or widows. There is an analysis of the social mix in 1851 here. Another article from The Times. This report comes from the edition of September 18th, 1838. There is a lot of detail about time in this report and a journey of four and a half hours was a long one. But a journey of this length, which would hitherto have taken 10 hours by the fastest stagecoach was an amazing phenomenon to those early Victorians. The journey from Euston to Wolverton took three hours and the passengers would have needed the 25 minutes to relieve themselves at the new station. Obviously someone had taken the trouble to organize a “rural feast”. The moment signalled a great change for Wolverton. Another account of this event can be found here. An inquest was held on Tuesday morning at the Ratcliffe Arms, Wolverton, before Mr. John Worley, coroner for the County of Northampton, to ascertain the circumstances attending the death of Mr. Edward Oliver, a cattle dealer, who lost his life by a collision which took place on the London and North Western Railway on Saturday evening last. Two other persons were also seriously injured, and are now in the Northampton General Infirmary. John Labrum said he was a guard of a special cattle train on the night of the accident. They left Rugby at 9:58 pm., and on arriving at Hanslope point they slackened speed, knowing a goods train was in front. As they turned the curve he saw the red signals on at the Wolverton station. The driver of the train shut off the steam, and he put on his break. It was then 11:30, and on turning round he saw a train coming up. He immediately jumped out of his break and ran back, waving his hand-lamp to and fro, also putting down fog signals. Three hundred yards back he met the train; it was a coal train, proceeding at the rate of 15 miles an hour. He believed the steam was shut off. The man Oliver was taken up quite dead, and two other persons with him in the same carriage with him were severely cut about the head, and also much bruised. The cattle train had its proper lamps at the tail of the train, which was visible half a mile off. John Pike, pointsman at Hanslope, deposed that the coal train passed about eight or nine minutes after the cattle train. His danger sign was on, but the driver did not appear to take any notice. He did not slacken speed. Neither the driver nor fireman seemed to be looking out. Mr. Edward Robinson, travelling inspector on the railway, said that if the engine driver had been looking out when he got past the curve beyond the Hanslope point he would have seen the tail lights of the cattle train in sufficient time to avoid the collision. Anthony Tomlinson, the engine driver, volunteered a statement that after getting through the cutting past the Hanslope point he saw the tail lights of a train ahead, and he shut off the steam, put on the break, and reversed the engine, but “she quickly flew into fore gear,” and in a few seconds the collision took place. The coroner summed up, and the jury, after a long deliberation, returned a verdict of “Manslaughter” against Anthony Tomlinson, the engine driver of the coal train. A few points here. There appear to be many more safety measures in place after the accidents of the early years. Trains now carry a guard van at the back to try to forestall shunts from the rear. Obviously it did not work in this case because the attention of the driver in the coal train was elsewhere. Accident continued on the railways, but they became more infrequent as the years passed and safety improved. The Radcliffe Arms is still much in use at this period, but it was north of the canal where the Wolverton Park is. Access was properly only from the Old Wolverton Road, but many of the pub’s customers must have come from Wolverton over the railway bridge to reach it. I wonder that there were never any reported accidents here. Until today, I had never come across the word deodand. If I had lived in the first decade of railway development I might have seen it regularly. The deodand, which means something given to God, was frequently in the news when railway accidents were common. The experimental nature of the technology and the lack of awareness of the dangers of speed led to a number of railway accidents, many of them fatal. The problem that juries found was that there was no mechanism in law at the time to award compensation to victims of accidents, so they settled on the medieval precedent of the deodand to meet the need. Under this law, the thing that caused the death could be seized by the Crown, sold, and the money donated to the Church – given to God. Later, a cash payment in compensation was acceptable. In the case of railway accidents, the locomotive was seen as causing the death and was therefore forfeit, or usually a monetary amount set at the value of the locomotive. In November 1840 at Harrow a waggon had apparently derailed in the late afternoon. The immediate stations along the line were notified and people began efforts to clear the line. At about 5 o’clock, a goods train, hauled by two locomotives (as was the practice in those underpowered days) was coming towards the accident on the up line. The first driver, Brown, shut down his power on seeing the red light but the second driver, Joseph Simpson, merely stepped it down and still maintained forward power. The rain collided with the one in front which was in the process of pulling the obstructing waggon out of the way. Brown survived the crash but his fireman, Dawson, was caught under the wheels while jumping for safety and killed, and apparently Simpson was also killed while jumping for safety. His fireman survived. After several days of hearings, the jury, which had also listened to evidence from John Bedford of Wolverton, Superintendent of Police, that Simpson had not previously been a negligent driver in any way, found Joseph Simpson guilty of the murder of William Dawson. Simpson, being already dead, could not be hanged for murder; however, the jury set a deodand of £2,000 against the value of the two engines. The tailpiece of this story is that the agent of Lord Northwick, Lord of the Manor of Harrow, appeared, in a piece of monumental cheek, to claim the £2,000 deodand for himself on the basis of a charter issued in the time of King Stephen. The judge very curtly told him that he would have to make his case to the Exchequer and would hear no more. In 1846 an Act of Parliament which properly dealt with compensation awards was passed, consigning the deodand to history. On Thursday evening last an accident, which was likely to have terminated seriously but for the activity and exertions of the Company’s servants and others, occurred to the mail train down, which leaves at half past 8. The following are the particulars:- Thursday being magazine night, a portion of them, in addition to the passengers’ luggage was placed on the top of the first class North Union carriage. When passing between Leighton Buzzard and Wolverton the guards perceived flames issuing from the top of the carriage just mentioned. The breaks were immediately put on, but, the wind blowing from the north east, and the train going at an accelerated speed, this portion of the line being on the decline, the flames got ahead before the engine could be stopped. So soon, however, was that accomplished, the passengers, ten in number, were assisted out of their perilous situation, and happily without any injury. Some of the property is saved, but a much greater proportion of course destroyed. The cause of the fire can only be conjectured, but it is presumed to have originated in a spark from the engine penetrating the tarpauling (sic), or lodging immediately under it. I don’t think these rickety arrangements of transporting a road coach, complete with passengers, lasted too many years after 1840. For one thing the railways were able to build rolling stock of their own, and as speeds increased, a coach held down by chains may not have been the safest arrangement. In 1840, trains had a maximum speed of 30 mph – in practice about 25 mph – three times the speed of a horse-drawn coach, but not too fast by later standards.